This article, which also appears among my Medium articles, was excerpted from chapter 9 of my Manning book, Linux in Action. Besides the book, you can also work through Linux in Motion — a hybrid course made up of more than two hours of video and around 40% of the text of Linux in Action. Building a LAMP server and getting it all nicely configured with reliable data handling, a domain, and a TLS certificate is only half the battle. You’ll also need to make sure your infrastructure is protected from the internet’s many frightening threats. In this article, I’ll explore website security through the proper use of system groups, process isolation, and regular audits of your system resources. It’s not the whole story (my Linux in Action book covers additional tools like installing TLS certificates and working with SELinux), but it’s a great start. The developers you support have (finally) come to realize that they need to restrict public access to the data and configuration files living on the application server while still allowing access to various dev and IT teams. The first part of the solution is groups. A group is a system object — much the same as a user — except that no one will ever log in to the system as a group. 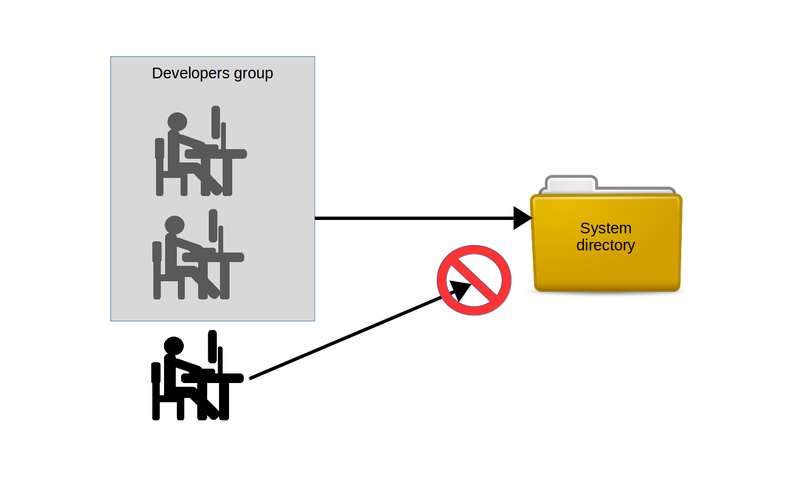 The power of groups is in how they, like users, can be “assigned” to files or directories, allowing any group members to share the group powers. This is illustrated in the figure. Try this yourself: use a text editor to create a new file. Add some “Hello world” text so you’ll be able to easily tell when you can successfully access it. Now edit its permissions using chmod 770 so that the file’s owner and group have full rights over the file, but others can’t even read it. CentOS. useradd will also work on Ubuntu. Use su to switch to your new user. Once you enter the user’s password, all the commands you execute will be run as that user. You’ll be working with only that user’s authority: no more and no less. If you try reading the datafile.txt file (using cat ), you’ll have no luck since, as you remember, others were denied read permission. When you’re done, type exit to leave the new user shell and return to your original shell. All this is expected and easy to understand. And, as you’ve seen, not being able to read the file belonging to a different reader can sometimes be a problem. Let’s see what we can do about it by associating the file with a group and then properly configuring the file’s permissions. Create a new group you can use to manage your application data and then edit the properties of your data file using chown . The ubuntu:app-data-group argument leaves the file ownership in the hands of the ubuntu user, but changes its group to your new app-data-group . Run ls with “long” output against the file to view its new permissions and status. Note that, as expected, ubuntu is the file’s owner and app-data-group is its group. once again, su to switch to a shell deploying the other user’s account. This time, even though the file’s permissions lock others out — and you’re definitely acting as an “other” user right now — you should be able to read it thanks to your group membership. Use su to switch between user accounts. These happened to be the contents of my datafile.txt file. This kind of organization is the correct and effective way to deal with many of the complicated permissions issues that will arise on a multi-user system. In fact, not only is it used to give individual users the access they need, but many system processes couldn’t do their jobs without special group memberships. Take a quick look through the /etc/group file and note how many system processes have their own groups. Worried that the multiple services you’ve got running on a single server will, should one service be breached, all be at risk? One way to limit the damage that careless or malicious users can cause is by isolating system resources and processes. This way, even if someone might want to expand their reach beyond a set limit, they won’t have physical access. The old approach to the problem was provisioning a separate physical machine for each service. But virtualization can make it a lot easier -and more affordable – to build a “siloed” infrastructure. this architecture is often referred to as microservices and would have you launch multiple containers with one, perhaps, running only a database, another Apache, and a third containing media files that might be embedded in your web pages. Besides the many performance and efficiency benefits associated with microservices architectures, this can greatly reduce each individual component’s risk exposure. By “containers” I don’t necessarily mean those of the LXC persuasion. popular. If you’re interested in learning more about Docker, check out my Pluralsight courses that touch on the topic. While any admin user will be able to temporarily assume root authority using sudo, only root is actually root . As you’ve seen already, it isn’t safe to perform regular functions as root. But it can happen — whether by innocent accident or malicious tampering — that a regular user can effectively get admin rights full-time. numbers will, like root, be zero (0). Take a look at the passwd file in /etc/. This file contains a record for each regular and system user account that currently exists. The first field contains the account name (root and ubuntu in this case) and the second field might contain an x in place of a password (which, if it exists, will appear encrypted in the /etc/shadow file). But the next two fields contain the user and group IDs. In the case of ubuntu in this example, both IDs are 1000 . And, as you can see, root has zeroes. If you ever see a regular user with a user or group ID of 0, however, then you know there’s something nasty going on and you should get to work fixing it. The quick and easy way to spot a problem is to run this awk command against the passwd file, which will print out any line whose third field contains only a 0. In this case, to my great relief, the only result was root . You can run it a second time substituting $4 for $3 to pick up the group ID field. The more things you’ve got running, the greater the odds of something breaking. So it makes sense that you’ll want to keep track of what’s running. This will apply to network ports (if they’re “open” then, by definition, there must be a way in), services (if they’re active, then people can run them), and installed software (if it’s installed, it can be executed). For audits to be useful you’ll have to remember to run them once in a while. Since you just know you’re going to forget, you’ll be much better off incorporating your auditing tools into a script that not only executes regularly but, ideally, also parses the results to make them more readable. Here, however, I’ll focus on introducing you to three key audit tools to help you scan for open ports, active services, and unnecessary software packages. Getting it automated will be your job. A port is considered “open” if there’s some process running on the host that’s listening on that port for requests. Keeping an eye on your open ports can keep you plugged into what’s really going on with your server. You already know that a regular web server is probably going to have HTTP (80) and SSH (22) open, so it shouldn’t come as a surprise to come across those. But you’ll really want to focus on other unexpected results. netstat will display open ports along with a wealth of information about how they’re being used. In this example run against a fairly typical multi-purpose server, -n tells netstat to include the numeric ports and addresses. -l includes only listening sockets, and -p adds the process ID of the listening program. Naturally, if you see something, do something. Getting a quick snapshot of the systemd-managed services currently enabled on your machine can help you spot activity that doesn’t belong. systemctl can list all existing services, which can then be narrowed down to only those results whose descriptions include enabled. This will return only active services. stop the service and make sure it doesn’t start up again with the next boot. random background system activity when I’m creating encryption keys. Could someone or something have installed software on your system without you knowing? Well, how would you know if you don’t look? yum list installed or, on Debian/Ubuntu, dpkg — list will give you the whole briefing, while remove <packagename> should delete any packages that don’t belong. which is something I cover in chapter 11. This article is excerpted from my Manning “Linux in Action” book. There’s lots more fun where this came from, including a hybrid course called Linux in Motionthat’s made up of more than two hours of video and around 40% of the text of Linux in Action.. Who knows…you might also enjoy my recently published Learn Amazon Web Services in a Month of Lunches.